Fifty-six unhappy and very brave men gathered in Philadelphia to make a document that told King George III in England that they meant business about being an independent nation. Those rich, white guys who wrote the Declaration of Independence took a huge risk on our behalf. They were done hoping King George III in England would work with them to reconcile their differences. They believed they had rights that were not being honored, among them the right to live freely in their own pursuit of happiness. As early as November 1774, King George had said, "Blows must decide whether they are subject to this country or independent." He called it correctly. By April 1775, the Revolutionary War had begun at Lexington and Concord, even though most colonists still hoped for reconciliation with King George and Great Britain. 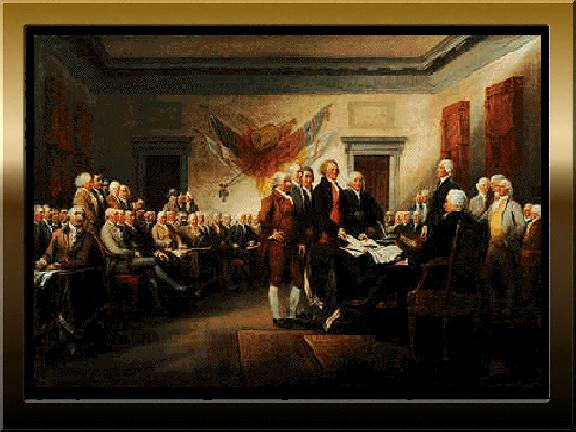 In July 1776, these fifty-six brave men gathered at Independence Hall in Philadelphia and adopted a statement called the Declaration of Independence. This formally announced that the thirteen colonies regarded themselves as independent states and were no longer a part of the British Empire. Instead, they would be a union, a new nation, the United States of America. This was an extremely radical move to make--telling King George III that they wouldn't be subject to his taxes without representation in the English Parliament, or other of his measures used against them. John Adams was a leader in pushing for independence. Thomas Jefferson was selected to compose the original draft of the document, which was edited and ratified by Congress by July 4, 1776. So, what about the rest of the fifty-six? For the most part, they were soft-spoken, wealthy, and educated. They were not wild-eyed ruffians looking for excitement. Twenty-four were lawyers and judges. Eleven were merchants; nine were plantation owners. Two became presidents of the United States-- John Adams and Thomas Jefferson. They all signed this document knowing full well that death awaited if they were caught by those who disagreed. They put their names to more than the Declaration of Independence. They pledged their lives, their fortunes and families, and their sacred honor. What happened to these risk-takers? By one report, five were captured, charged as traitors and tortured to death. Nine fought and died in the Revolutionary War. Most of them had their homes ransacked and their properties looted, burned, and destroyed. Their families were killed or jailed. There were even times when they were captured by their own neighbors who did not agree with the idea of independence from Great Britain. But they had pledged: "For the support of this declaration, with firm reliance on the protection of the divine providence, we mutually pledge to each other, our lives, our fortunes, and our sacred honor." We'll never find more dedicated freedom fighters. Now that Independence Day 2013 is behind us and the trash from fireworks has been cleaned up, our mouths can drop wide open when we realize what it meant for these fifty-six to value liberty more than security. In the end, they paid for today's freedom. This might be the only flag that does not fly. It is made of more than 400,000 Larkspur plants with multiple flower stems on each and is located close to Vandenberg Air Force Base near Lompoc, California. This floral flag is 740 feet long and 390 feet wide. Quite a sight, huh?